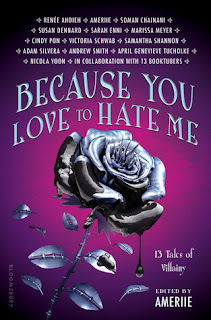 By now, you've probably heard me say a lot on Because You Love to Hate Me, a YA villain-themed anthology edited by Ameriie that pairs booktubers with authors (cc: pre-order promo, back cover reveal & anthology pairing, front cover reveal, original book blog post announcing the anthology, original EW cover reveal post (read Ameriie's introduction)). So then you won't be surprised that today I have a Q&A with Ameriie, who is both the anthology editor and the author with whom I was paired. If you're curious at all about the anthology, check out what Ameriie has to say! A: This is our first Hangout. Neither of us have ever done a Google Hangout (on Air) before. TB: All right, so maybe for our starter question, let's get Ameriie talking about what inspired her story from that blurb. How did she go through her process? TB: --Countess, but I can't remember her name right now either, [laughs], oh! [Note: this is who we were discussing]. A: --on her too. I just love villainous-- see, I always rooted for the villain. We've had so many conversations about this, it's always about the villain. Seeing the other side, and trying to understand what's going on with that person, and I think it's just, that's kind of, I've been obsessed with that. Like forever. Just 'cause I always, I have a lot of empathy for the villain, I think I always do. Ever since I was a kid. So a lot of those things that people would think are funny, like a lot of the Roald Dahl books in which the child is playing all these pranks on the teacher, I was just thinking, maybe the teacher is sad and lonely when they go home, there's no one there. There's so many reasons why they're this way. How about you? How easy was it, or how difficult was it to come up (not only) with so many prompts, but just getting into that head space in the first place? TB: You know, I mean anyone can daydream. A: But you write, too. You do write, so you know, you know all about that side of things as well. TB: I don't know. I think the, the stage of writing that's literally the easiest to do is coming up with the ideas. The ideas, right? 'Cause you can think of so many different things, you're like this would be so cool if I got read about it, but then like, actually exploring the details and making them come to life is what's really key and what's really fascinating whenever you're reading. Right? And that's what you do so well with, like, the little details in your story are excellent. A: Oh, thank you! For those of you guys who don't know, Christina's also my critique partner. And she's awesome. She's really helped me a lot, um, she's, I think you've read everything. You've read everything. You've read everything, I believe. TB: It is, but I have no doubt that you would've been able to succeed with any prompt that you were given. A: --Jack is horrible! He's a thief. A: Why is the giant the bad guy? I didn't understand why the giant was the bad guy. I, I, for the life of me, could not understand that. TB: Giants are always the bad person or the bad creature, and when they're not, it's just like the exception to the rule. A: You wrote a great breakdown on giants and what they've always meant to people and how what they symbolize. Do you want to go into a little bit of that as far as what you wrote in there? TB: --who gathered everyone, gathered the idea of Because You Love to Hate Me. A: --project, and I would love for you, you know what I mean? People ask them things like that all the time. I just did not want to add myself to that list. So, but, I was really happy, because I made some new friends, and I was able to pull together the project, and I did not do it by myself, because I mean, like, without everyone involved, every single contributor, without my agency, there's no way that it would've happened. There's just so many moving parts, 'cause I think there's like twenty-six of us, right? Yeah, I mean, usually I think an anthology, my agent was saying, is like thirteen 'cause you know you're dealing with the contributors. And you might have a little more if you have someone writing a foreword and that kind of thing, but to have like twenty-six, it's just, that's a lot. But actually it's gone pretty smoothly. TB: Do you think that you would do something similar like this in the future? TB: --you're the responsible one. A: Yes, that would definitely be a little crazy. TB: So I was thinking that maybe we could wrap it up with uh, just like if there was one thing that you wanted to tell everyone about the anthology, what would it be? TB: But don't be underselling your story. I love it and everyone else is going to love it, too, girl. A: Thank you. I do really like my story as well. I do really like my story as well. I love it. TB: Woohoo! All right, so Because You Love to Hate Me is being released on July 11th, and we hope that you all can pre-order between now and then. 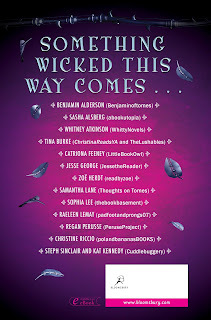 If you want to join us on twitter, from June 5th through July 24th, we're going to be talking about villains then, again, and you'll probably hear more from us in the future, soon, too, [laughs] about the anthology. A: We're all on the internet. Make sure you guys pre-order! Support the anthology 'cause we want to also do this again. After all, there is a pre-order promotion! On Mondays, from June 5 - July 24, check out the Bloomsbury twitter feed, as we'll be discussing villains more generally. You'll also hear more about the anthology pretty soon from all of us! The anthology releases July 11, 2017 from Bloomsbury. I hope you all are as excited about it as I am!